PSA: why the heck don’t cyclists stay right? Wouldn’t it be great to air a public service announcement saying why cyclists don’t stay right all the time? After all, this blog can’t reach everyone. How’s this? MAN: Hey, there’s a bicyclist. Why is he riding so far to the left? Shouldn’t he move over? WOMAN: Not if he wants to be safe. There are a lot of cars parked along the street. 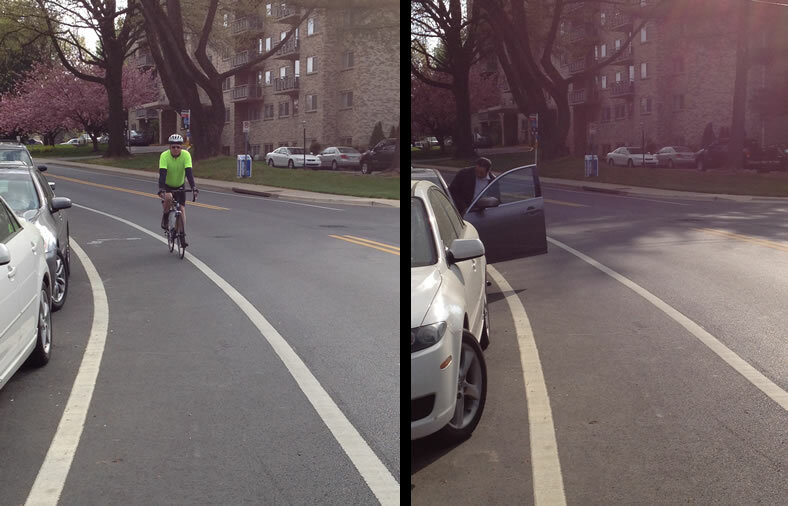 Cyclists should always stay well away from parked cars because a driver might suddenly open his door. MAN: Even if there’s a bike lane? WOMAN: You bet. A cyclist might also leave the bike lane to avoid leaves or broken glass or potholes or to get ready to turn left. MAN: I get it. Look, there’s another bicyclist up ahead. There’s no parking but she’s in the middle of my lane. WOMAN: That’s because the lane is too narrow for cars to pass her in the same lane. If she rides all the way to the right, some drivers will think they can pass in the same lane and they’ll come way too close to her or even hit her. But if she rides in the middle of the lane, drivers won’t pass until they can move over, and everyone is safer. WOMAN: And one more thing Mike. Drivers must always keep at least three feet to the left of cyclists when passing. That’s the law. MAN: Wow. There’s so much I didn’t know. I’ll definitely keep an eye out for cyclists in my lane now. It should be broken up into a couple shorter PSAs, but you get the idea. Here are some more topics: Why aren’t cyclists using the bike path? What are those funny bike markings with arrows in the middle of the road? Bicyclists – Stay Away From the Edge!